In the past, members have shared their hopes and dreams for the future Pirates LEGO sets in threads like What do you want to see in the next round of the new line? However, in the past we didn't have a LEGO Ambassador so the likelihood of your feedback reaching the LEGO Group was small. But that has changed and I will summarize all the suggestions and wishes submitted in the old thread (which is now closed) along with any new ideas presented in this thread. Share your desires for the future of the LEGO Pirates theme and this time your feedback will be delivered to the LEGO Community Team! Please note there is no guarentee your ideas will be used and you will not be credited or receive any recognition if they are. But this is YOUR opportunity to shape the future of the LEGO Pirate theme so make the most of it! You have the month of August to be heard! After that this thread may be closed and never open again. Those sets also contain a lot of useful MOCing parts and are very accurate and realistic. I also think it will sell quite good since a lot of adults collect huge sets like that. And of course I'd like to see the Bluecoat faction again in the new line! I think you're doing a great job as ambassador so far Bonaparte! It would be nice to see a harbour with common people, soldiers and smugglers/pirates. Not only soldiers and pirates, like in 2009 pirates sets! Also bluecoats instead of redcoats could be seen in new pirates sets! And the special designed eclusive set! A Soldier ship (I know its obvious) would be nice with another high rank officer and perhaps some new Pirates. Further elaborations on the deserted jungle island scenario, where Pirates and/or Imperials find traps, ruins and treasure. I agree the idea of the deserted jungle is very nice. It should stretch several baseplates so you can explore the area. It would be awesome with some old native ruins, caves and treasure! If a set like this appears in the shop I defenitely buy some! A soldier ship, A set like the midevil market, and Bluecoats. "good guy" ships, and I bet it would include at least four figures. Next on the list would be a large port, which would be compatible with the earlier Soldier's Fort. It would probably include a small, brick built ship and a crane, as well as a building or two and several docks. Other great set ideas would be a new hideout for the pirates that centers on a cave rather than a shipwreck, as well as a small Imperial outpost and a couple new impulses. All of these sets, while already done before in the classic Pirates line, would be great additions to the current pirates line as well. The trait of having no civilian figures is hardly exclusive to the 2009 Pirates reboot. Unlike Castle, which had average citizens like maidens and blacksmiths early on in it's 20+ year history, Pirates has never had a single civilian figure - with the possible exception of the Governer's daughter, who is part of the very 2009 pirates line you are criticizing. Nevertheless, this doesn't excuse that disapointing trend, and if we do get a large port in 2010, it would be ideal for TLC to break the pattern and add one or two civilian figures. EDIT: Oh yes -- and ruins too, of all kinds of megalithic temples and statues! If they'd make an soidler ship I'll have to get it. I was considering BB Bounty but a soilder ship would be alot better then those little bark blue boats. I hope one of those would act as a life boat. A MMV-ish set. Something that's full of life. Lots of details. A Port? I'd really like to see more imperial powers. Bluecoats would be very nice to see in addition to the current redcoats. Natives are always good, as well. Really, I just want more factions than the two currently available. It would be nice to see a harbour with common people, soldiers and smugglers/pirates. A couple of years ago we suggested a Dutch Merchant sub-theme with a focus on trade and the East India company would be an interesting way to introduce common people into the Pirate theme. I would like to see some blue coats. The red coats should have their own, large ship, and some add-ons for the Soldier Fortress set. For the blue coats TLC maybe can release a smaller base, with a row boat and a new governor or admiral minifig for them. Possibly there could also be new islanders similair to the old ones, with their own island. Harbour in style of Medieval Market Village would be awesome! This is probably getting repetitive, but a s@h exclusive port would be great. I like Mr. Phes' idea of Dutch East-India traders, which could be nicely integrated into a port. Another idea for an exclusive could be a really detailed ship (with separately available crew-packs, including flags and perhaps two sets of sails, so that you can decide for yourself what faction owns the ship). I'm really looking forward to one or two exclusives in the Pirates line. Pirates - after town and castle - deserves it! 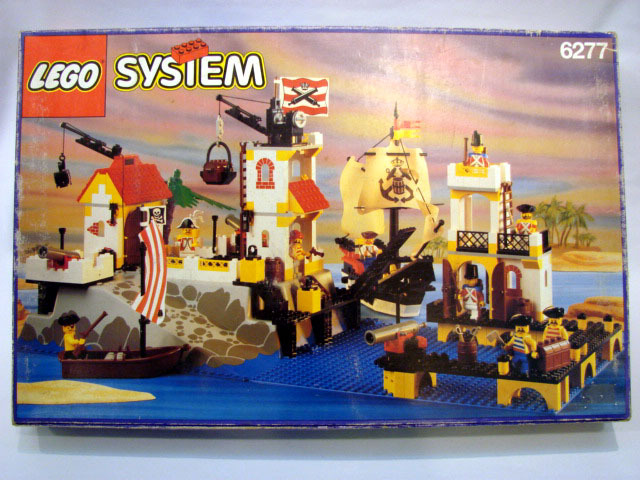 Next to town, castle, and space, pirates should be Lego's fourth ever-lasting line of products. As for the regular line, I wouldn't be afraid to use ideas from Pirates I's early years. I like the cave-hideout idea as well. An Imperial ship and Traders' dock would also be nice for the regular line. And eeehhhmmm... blue coats would be nice too. Although for me that's definitely not top-priority (2011 would be fine, if that would mean the line would last long into the future). 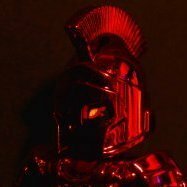 Finally, it's cool that Lego is listening to input from the community and that you, Bonaparte, do such a great job as an ambassador by taking the time to compile and forward all requests to Lego. Go Classic Pirates! A set like the imperial trading post (below), would be nice with a sort of harbour with civilians. It would probably have a pirate rowboat and a small merchant boat the size of the one below. This should be full of play value and allow numerous scenerios for kids to play with while at the same time giving the afols a set like those of the old line. It would be the 70 USD set. I think they should also make a smaller pirate ship like the rennegade runner (below). This would allow for people who missed last years ship to have a boat for their pirates and would increase the play value of the imperial ship because you could line them up and have them fight. It would serve as the 50 USD set. This is pretty much what I expect from next years line, plus a bunch of smaller sets that I don't care about. 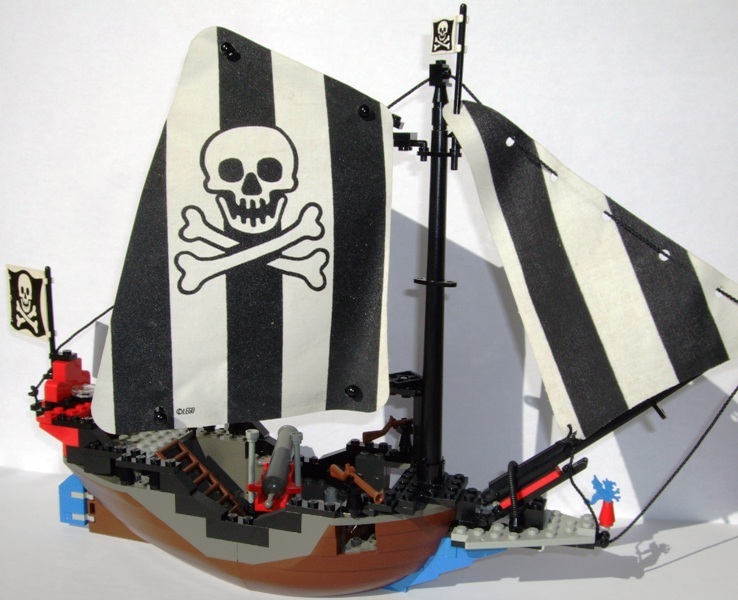 I would like a New Imperial ship (As would everyone else) but not like the Brickbeards bounty. A ship that we know has been worked on, Ok, Not a MOC style ship with 5 Mid-sections because I know Lego and there prices, that would be over £150. Like the Imperial Flagship but with a tumblehome, and make it look more realistic, like a British ship would! I would like to see the Lego Armada make a return aswell! It had some amazing figures, alas it was short lived. And mabye a small Galleon looking ship, Like the Drumstrag ship but not with the 4+ Hull. However, I do not exactly agree on the Dutch Trading company idea, for Lego would not ever make it VOC, they would just put a bunch of traders in a small ITP ship. The traders would just look like Castle figures. I would like to see the Bluecoats start off with Small sets like rowingboats and small holdouts like Sabre Island. There is a chance for that. Lego has already created Temples in Indiana Jones so there may be something there! Just as already suggested, maybe a LARGE ship intended for AFOLS (16+) with the design standards of the CC, GG, and even the UCS of Star Wars (although still in minifig scale) I see some of these huge MOCs that I am sure would be miraculous to build (ahem, Bonaparte) and I just think that with the overall quality and authenticity of a LEGO designed set would be dandy. Adding a vote for soldiers ship and add-ons to the new harbor. I'd love to see some citizenry and new pirates too (no more captains though, just the swabs!). Blue Coats like we saw in the battles trailer. An imperial ship that is as big or bigger than Barracuda or Schooner. As to something I would personally not like to see: Islanders, at least not like in the Pirates I line.